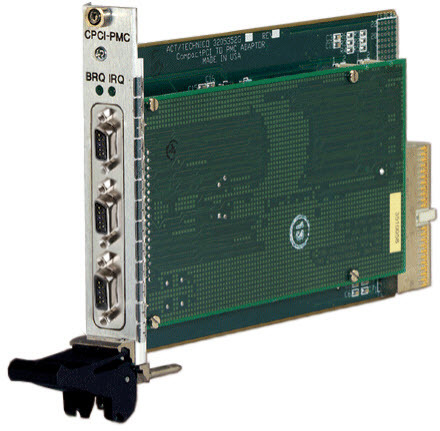 Comm Bus Interface Card - GX3903 | Marvin Test Solutions, Inc. The GX3903 is a 3-port, cPCI asynchronous communications interface board supporting RS-232, RS-422, and RS-485 interfaces. Each port is configured at the time of order for RS-232, RS-422 or RS-485 signaling. The default configuration is RS-232. For RS-232 mode, each port supports RTS, CTS, TXD, RXD, DCD, DRC, DSR, and RI signaling. The RS-422 mode supports TXD, RXD, CTS, and RTS with each line operating differentially with a uni-directional drive. In RS-485 mode, the card supports both 2-wire and 4-wire configurations. In 2-wire mode, a single differential RS-422 pair operates in half-duplex mode. For 4-wire mode, the TXD is driven on an additional RS422 uni-directional output. Control of the Tx/Rx direction is performed via the RTS control signal from the 16550 UART. The differential RS-422 / RS-485 ports are terminated with 150 ohm parallel terminations. Alternate terminations can be specified at time of order. Interfacing to the 3 ports is provided via (3) front panel mounted Micro D9 connectors. Support for each port is provided by a 16550 UART which operates at data rates up to 115 K baud. Mapping of interrupts, INTA/INTB/INTC/INTD from the PCI bus to each UART is done via switches located on the board, supporting both shared and dedicated interrupt requests. Standard Windows COM drivers can be used with the GX3903. Factory configurable. Default configuration is RS232.